This U.S. Mint sales report covers the week ending February 12, 2017. 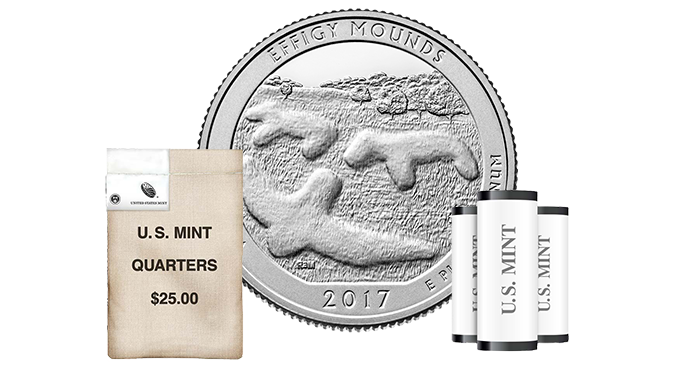 During this period, the Mint released the 2017 America the Beautiful Effigy Mounds National Monument quarter bags and rolls (Feb. 6). No items have been newly removed from the Mint’s report, and there were no significant downward adjustments. The Lions Clubs International commemorative silver dollars—the Mint’s first commemorative coins of 2017—are now in their fourth week on the Mint’s sales report. Each of the two formats has slipped a notch from the place it held last week: the Proof coin (17CH), with 3,446 units sold, has moved from first place to second, while the Uncirculated coin (17CJ), with 874 units sold, has dropped from fifth to sixth. The number-one seller this past week for the Mint was the 2016 U.S. Mint Uncirculated Set, with 3,698 units sold. Despite being nudged from the top spot by one of last year’s products, the Lions Clubs Proof coins have sold through the Mint’s available stock. With almost 38,000 sold (of a 400,000 mintage limit), the coins are temporarily unavailable on the Mint’s website. In third place is the 2016 one-ounce American Silver Eagle Uncirculated coin, with 2,677 units sold. It is followed in fourth place by another 2016 product, the Presidential $1 Coin Proof Set, with 1,768 units sold. The top five is rounded out by the 2017 ATB Quarters Proof Set, with 1,720 units sold.